Our training method is based mostly on practice, ie to perform the exercises yourself, see how others perform and correct them in their exercises – both in words and physically. Some will be pure theory so bring your pen and paper. We want you to bring extra training clothes, preferably tight ones. We shall use rings, paralettes, rigs and dumbbells, but mostly you will use your own body. How do we want you to contribute? We want you to be really engaged – both in yourself and in the rest of the participants. We want you to be open minded and even willing to abandon your habits. 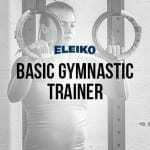 Who will benefit from Eleiko Basic Gymnastic Trainer? It does not matter what background you have, but it helps a lot if you have worked in the fitness industry and have experience in training. It is also good if you have decided to go ”out of the box”. – What is required to perform different exercises (flexibility, strength, etc. ).